In 1989 the Minnesota Timberwolves became the first team to play in Minnesota since the Lakers left in 1960. The Timberwolves had the same fate as most new NBA teams when they first entered the league. They struggled for a few years. They did not have much success at all in from their first season in 1989 until 1995. In that stretch they never won 30 games. In 1995 the T-Wolves drafted the future face of their franchise. They drafted Kevin Garnett out of high school. In his first season, the Wolves did not improve as they only won 21 games. In Garnett’s second season with the Wolves, the team went to new heights. 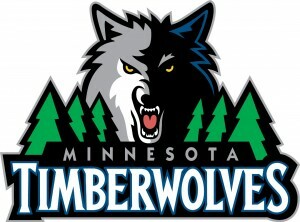 The Wolves easily surpassed their previous win total by going from never winning 30 games to winning 40 games in 1996. They would not however have a winning record as they finished with a 40-42 record. This was good enough to make the playoffs for the first time in team history. The Wolves would be swept by the Rockets in the playoffs though. Making the playoffs was a start for the team. They would build off their first trip to the playoffs by returning to the playoffs the next year. They finished with a winning record for the first time in their history when they finished with a 45-37 record. They would make the playoffs and face the Supersonics this time. Their first series win would not come this year, but the Wolves would get their first two wins in the playoffs. The Sonics would win the series 3-2. Kevin Garnett continued to emerge as a leader on the team and in the league. The Timberwolves signed him to one of the biggest contracts in NBA history to ensure he would stay in Minnesota for the next six seasons. The Wolves suffered a minor set back in 1999 when they second best player on the team Stephon Marbury forced himself to be traded because he would not be the biggest start on the team due to Kevin Garnett’s dominance. The Wolves finished with a .500 record, but they did manage to make the playoffs. They were defeated by the San Antonio Spurs who went on to become the NBA championships that season. The Wolves continued to develop into a perennial playoff team. They qualified for playoffs yet again. They would continue to struggle in the first round and were defeated yet again. In 2000 the Wolves recorded their first ever 50 win season. The Portland Trailblazers were the team to end the Wolves playoff run in 2000. 2001 saw the Wolves have their second consecutive 50 win season. In 2002 they put together their third straight 50 win season. Despite their continual great play in the regular season, the Wolves continued to be defeated in the first round of the playoffs. Kevin Garnett continued to climb higher and higher in the eyes of the NBA during these times. He was becoming a player being mentioned annually in the MVP discussion. 2004 was the year in which Garnett and the Wolves took another step in the right direction. Garnett finally won the MVP with incredible averages in points, rebounds, and assists. The Wolves would go on to advance past the first round for the first time. They also won the second round of the playoffs to make it to the Western Conference final. They could not get over the hump in their first season as one of the final two teams in the West. They would be defeated by the Lakers. This would be the climax of the Minnesota Timberwolves NBA existence to this point. The Wolves have slowly digressed since then. After making it to the Western Conference finals as the 1 seed in the West, the Wolves had a lot of off the court issues the next season, and they missed the playoffs despite having a losing record. Not only would they miss the playoffs that season in 2005, the Wolves also missed the playoffs in 2006. The trend would continue every season since then. The Wolves have yet to make it back to the playoffs. Their slide as a franchise led to them trading away their former MVP Kevin Garnett to the Boston Celtics. The Wolves would watch as Garnett went on to lead the Celtics to an NBA title after the trade. For a few season the Wolves failed to have any identity as a franchise. They were one of the worst teams in the league. The Wolves have changed that around in the past two seasons. The development of Kevin Love has been the turning point for Minnesota. Kevin Love has been a player that will help Wolves fans forget Kevin Garnett. With the addition of Ricky Rubio this season, the Wolves are making a case to being back on track to the playoffs. The Wolves were in the playoff hunt until Rubio went down with a season ending injury earlier this season. For the first time since the Garnett trade, the Wolves have hope for the future.